Job Search Fears? Don't worry, be active! If you're in the middle of a job search, you can't help but be a bit stressed out and worried about your chances of success. But don't let it get you down! In this excellent article, guest author Kevin Donlin offers three ways you can stop worrying about your job search by taking small, positive actions today. Want to put an end to your job-search worries? Or at least, you can channel worries into positive action that moves you closer to employment every day. That's a message I got from the book, "100 Ways to Motivate Yourself," by Steve Chandler, who writes: "The next time you're worried about something, ask yourself, 'What small thing can I do right now?' Then do it. Remember not to ask, "What could I possibly do to make this whole thing go away?" That question does not get you into action at all." Trying to solve all your job search problems in one fell swoop can paralyze you with confusion. Let's tackle the second one first. No matter who you are, you'll almost never go from unemployed to hired in one day, just as you can't lose 50 lbs. in a week or master French in an afternoon. Heck, even Barry Bonds has been out of work for over a year, despite his Hall-of-Fame resume. So stop tearing your hair out. You probably won't get hired from one action, but many. It may take a week, or several months, but the job you seek is out there and you will get it after you've taken enough of the right actions. We all know someone well-connected to potential job leads, with whom we haven't spoken in months or years. Pick one person and call them today, just to say hello. Be sure to do one thing: Ask, "What would help you do your job better these days?" Then write their reply down. After you hang up, brainstorm ways to help your friend do his/her job. You can ask other people in your network or Google for ideas. Keep going until you find at least one promising idea. You will then have an excuse to call your friend back tomorrow. This will do two things: jump-start a dormant relationship and put you top of mind with a well-connected friend, both of which will make them more likely to send you employment leads. Have you ever submitted a resume to a blind ad online or in the newspaper, one that told you nothing about the company? And how did that work out? By contrast, the more you know about an employer, the clearer your path to employment will become. It could be that a manager there went to the same school as you, or you go to the same church as the CIO, or they sell to a client you used to work for. 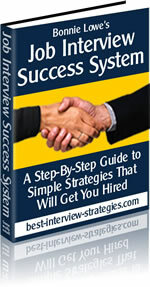 There are literally thousands of ways to make a connection with your next boss and stand out from ordinary job seekers. But you'll never know until you research the 10-20 companies you want to work for. Why not pick one employer today and spend 15 minutes learning all you can about their employees, corporate culture, clients, problems, and opportunities? Then try to make a connection based on your experience, education, and network of contacts. What's the last question on earth you want to be asked in a job interview? Is it, "Why did you leave your last position?" Or, "What are your salary requirements?" Or the dreaded, "What's your biggest weakness?" Whatever questions scare you, write them down. Something magical happens when you write a problem on paper. It's like shining a light under the bed to check for monsters--when you see things clearly, most of the fear factor vanishes. Also, any interview question that scares you has been asked before. Which means there's an answer for it. And you can find that answer by searching online, reading a book, or asking a friend who works in HR. Now. What if I haven't addressed your job search worries in this article? No problem. Simply write down whatever is bothering you, whether it's your age, lack of experience, the job market in your city, etc. Then, spend just 5 minutes doing something about each worry today. Will you solve all your job-search problems in 5 or 15 minutes? No. Will you be taking action toward solving those problems? Yes. And action dispels worry, just as sunlight dispels fog. As Steve Chandler writes: "When you find yourself worrying about something, ask yourself the action question, 'What can I do about this right now?' And then do something. Anything. Any small thing." Prove it for yourself and try it today. Kevin Donlin is Creator of TheSimpleJobSearch.com. Since 1996, he has provided job-search help to more than 20,000 people. Author of 3 books, Kevin has been interviewed by The New York Times, USA Today, Fox News, CBS Radio and others.